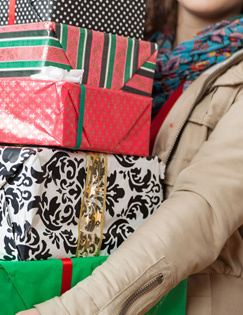 The holiday season is a magical time—not just for children, but for retailers as well. End of year sales offer the biggest opportunity for businesses to meet annual revenue goals as shoppers scramble to find Black Friday deals and holiday gifts. According to the National Retail Federation, “20-40 percent of yearly sales for small and mid-sized retailers take place within the last two months of the year”—making now the opportune time to begin preparing your store for the seasonal push. To help you get started, Vulcan Industries’ Director of Creative Strategies Chuck Lee offers inspired ideas for priming your merchandising displays for the holidays. Most big-box retailers design store layouts to include a designated space for seasonal merchandise. During the year, this area might be used for back-to-school, Halloween, Fourth of July, or other timely promotions. To inspire shoppers to load up on supplies for Thanksgiving and end-of-year holidays, front-of-store grocery display fixtures may feature ingredients for cranberry sauce, pumpkin pie, stuffing, and other traditional favorites. Organize your store with seasonal merchandising in mind, and you’ll keep aisles easy to shop when the holidays roll around. During the holidays, the number of shoppers entering retailers’ doors dramatically increases, and with it comes more dirt and clutter. In a rush to grab deals, customers leave shelves in disarray—a condition that creates stress and frustration for subsequent shoppers who are unable to find sought-after items. To keep consumers happy and apt to re-enter your store, instruct sales attendants to regularly clean and replenish shelves. Leave no blank spaces between items, creating a “tight” sales floor that’s only restocked periodically. Remember to leave aisles open and easy to navigate; with the increase in store visitors, cardboard sales bins and other in-aisle “interrupters” may hinder flow and create bottlenecks in store traffic. To further aid visibility, clean skylights and keep fluorescents on during the day for a brighter, more cheerful atmosphere. How many times have you left a store only to realize there was an item you forget? Busy stores filled with stressed-out shoppers often affect our ability to remember small-ticket items, such as gift bags and wrapping paper, that are just as fundamental to gifting as the presents themselves. Near checkout, place point of purchase displays stocked with batteries, tissue paper, bows, and stocking stuffers. Consider offering free gift wrapping as a special service to customers who purchase items from your store. The word-of-mouth advertising that results from this simple gesture will likely garner more sales than you ever imagined. Prepare your store for seasonal merchandising with in-stock and custom store fixtures from Vulcan Industries. Contact us or request information today!